The Organisation Africaine de la Propriété Intellectuelle or OAPI (English: African Intellectual Property Organization) is an intellectual property organisation, headquartered in Yaoundé, Cameroon. The organisation was created by the Bangui Agreement of March 2, 1977. The Bangui Agreement was subsequently amended in 1999. 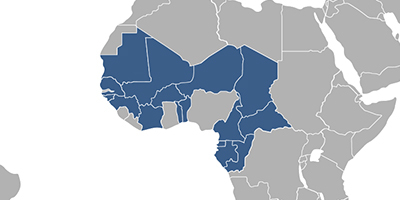 The protection of the IP types registered in OAPI is automatically valid on the territories of the following countries: Benin, Burkina Faso, Cameroon, Central African Republic, Chad, Congo, Republic of Côte d'Ivoire, Equatorial Guinea, Gabon, Guinea, Guinea-Bissau, Mali, Mauritania, Niger, Senegal, Togo, Comoros. It is not possible to designate an individual country for separate protection. Fees associated with registration of IP rights in OAPI are available in the fee calculator.